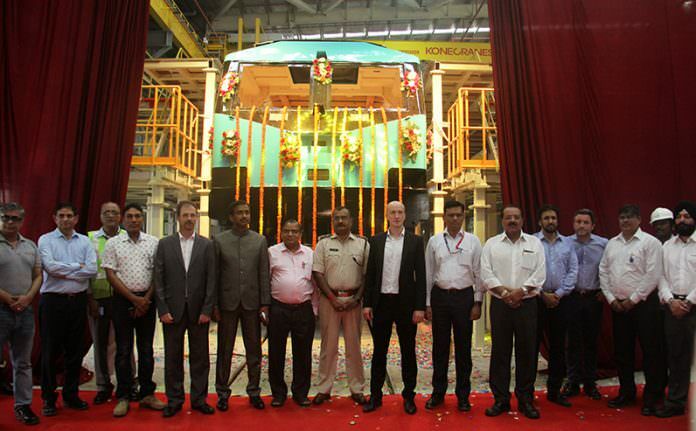 Rolling stock manufacturer Alstom has started production at its electric locomotive manufacturing facility in India. The 250 acre site, located at Madhepura, in the state of Bihar, is Alstom’s first electric locomotive manufacturing facility in the country and is part of a joint venture with Indian Railways (26 per cent). It currently employs 70 people with plans to boost staffing levels by 25 per cent each year until it reaches full capacity. The new factory will produce the Prima T8 (WAG12) locomotive, which has been specially adapted for the Indian network. The first two car body shells have already arrived at Madhepura and will be soon fitted and assembled at the plant. The first locomotive will be ready for roll-out early next year. The first five locomotives by 2019 followed by 35 locomotives by 2020, 60 in 2021, and 100 every year till the target of 800 is completed. Alstom’s Asia Pacific senior vice president Jean-Francois Beaudoin said: “The E-loco project is one of the most prestigious projects for Alstom worldwide and this feat, therefore, is a commendable achievement for the entire company. “In order to make a difference in this market, we need local expertise, competitive manufacturing capacity and close relationships with our customers. “The commencement of production at the plant is a perfect testimony to our strategy to develop and grow a localised ecosystem to bring wide reaching benefits for railways and the community at large.”. Alstom’s current manufacturing footprint in India includes its metro rolling stock manufacturing facility at Sricity and its component manufacturing facility at Coimbatore. In addition, it also has a rolling stock and signalling design and engineering centre in Bangalore.